Naomh Mearnóg are delighted to staged the Paddy McConnell 7s tournament on the 30th June 2018. This Junior football 7 aside tournament (all players must be 35 or over) is a memorial tournament in memory of Paddy McConnell, a member of Naomh Mearnog. 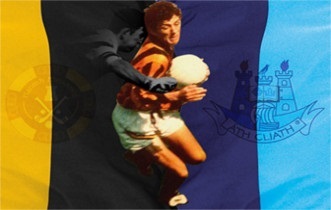 The tournament will take place on Saturday the 30th of June in Naomh Mearnóg GAA Club in Portmarnock, Co. Dublin. All proceeds left over when all expenses are covered will be donated to Cancer Research, in memory of Paddy McConnell. There will be open collection buckets on the day for this cause for spectators and supporters. The facilities of the club will be available to all players and supporters on the day. There will be tea, coffee, scones and a bbq (burgers & hot dogs) for sale throughout the day with bar service available in the club’s bar. Phone number of Main contact. The number of teams you wish to enter into the tournament.